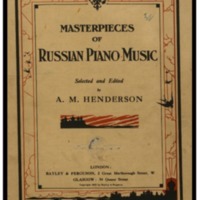 Masterpieces of Russian piano music. Book IV / selected and edited by A. M. Henderson. Includes works by Anton Arensky, Reinhold Glière, Heinrich Pachulski, Sergei Rachmaninoff, Vladimir Rebikoff, Peter Ilyitch Tchaikovsky & Alexander Zarzycki.